This is a rare tumor that only exceptionally involves the urethra and is therefore difficult to diagnose. Urethral leiomyoma can present in the form of urinary tract infections, detrusor instability, hematuria, dyspareunia, and, more rarely, dilatation of the proximal urinary tract. Treatment is surgical. There is no risk of metastases, but local recurrence can occur in the case of incomplete resection. Some authors propose a simple monitoring by MRI when the tumor is not symptomatic. The major drawback of this approach is the lack of histological analysis, therefore definitive diagnosis. We report the case of a female patient of 59 years post-menopausal who consulted for dysuria with a clinical examination showed a perimeatique injury (urethral caruncle) and in which the paraclinical examination showed a paraurétrale mass on MRI. Histology after endoscopic resection is in favor of a benign tumor (Leiomyoma of the urethra) the patient has a simple monitoring. Leiomyomas are benign tumors developed at the expense of smooth muscle [1, 9]. The locations in the female urethra are rare. Only forty cases have been reported in the literature [2, 7]. Clinically is Very difficult to distinguish from other urethral injury, the diagnosis of leiomyoma is established by histopathological examination [8, 10]. We report the case of a leiomyoma of the female urethra, and we discuss the strategy of the management of this pathology. 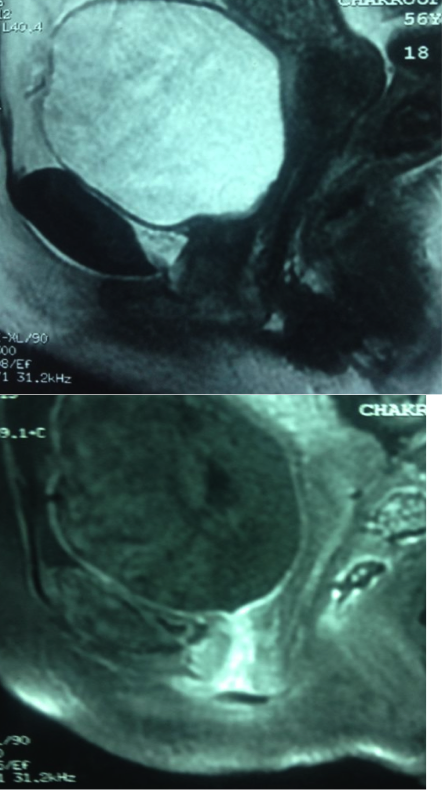 We report the case of a female patient of 59 years with no notable medical history , menopause who consulted for signs of lower urinary appliance type dysuria with clinical examination has perimeatique injury ( urethral caruncle ) (Figure 1) and in which the paraclinical examination showed a para urethral mass by MRI (Figure 2). After endoscopic resection histology was in favor of a benign tumor (leiomyoma of the urethra), the patient has a simple monitoring. Leiomyoma of the urethra is a rare tumor, the first case described by BUTTNER in 1894 , the tumor is more common in women than in men, with an average age of onset of 40 years [3, 5, 13]. The exact etiology of this tumor is not known. For many authors, this tumor is hormone [11, 15, 16], although this notion is controversial [13, 14]. Histological, the Leiomyomas are tumors interesting female genital tract, they consist of smooth muscle. The urinary tract is unusually touched. Preferred sites are the kidneys, the bladder and the urethra. In the urethra, it is mainly the proximal portion (posterior) is affected [3, 10]. Urethral leiomyomas are benign tumors No malignant transformation leiomyoma has been described. Local recurrence after removal is possible but rare [10, 13]. Clinically, leiomyomas may long remain asymptomatic. The most commonly described symptoms are, in order of frequency: urinary tract infections, mass effects in the anterior vaginal wall, and dyspareunia. More rarely, they cause an unstable bladder, and gross hematuria [3, 5]. Diagnostic tests are necessary to determine the size of the tumor, its internal structure, and its relations with neighboring structures. MRI has a high diagnostic value [6, 10]. CORNELLA showed that the leiomyoma is characterized by a low signal on T1 and T2 hyper intensity. The tumor is enhanced to gadolinium, reflecting hypervascularization . CHANG showed a shorter acquisition sequence may optionally be used. It has the advantage of being much faster than a complete MRI , but the quality of the information collected remains to evaluate . The leiomyoma is a benign tumor, common in the uterus but very rare in the urethra. Its diagnosis is rarely mentioned. The Para- clinical evaluation specifies the characteristics, the reports of the tumor, and directs its nature. Surgical resection by open or endoscopic approach allows both diagnosing and treating the symptoms. Andreou A., Pfister C., Ben Amna M., Tapon E., Gobert F.,Grise P. : Léiomyome vésical. Approche diagnostique et thérapeutique.Prog. Urol., 2003 ; 13 : 693-697. Buttner. : Ein Fall von Myom der Weibliehen Urethra. Z. Geburshc. Gynäk. 1894; 28: 135. Kretschmer H.L. : Report of a case of a myoma of the female urethra. Trans. Chicago Path. Soc., 1909-1912; 8: 173. Robbins S.L. : Pathology. Philadelphia: W. B. Saunders Co., p. 1133, 1967.